Changing lanes whilst driving, for a learner driver can often seem like a precarious situation. The driving test may involve changing lanes either intentionally, or a learner, they may realise that they are in an incorrect lane and may need to change in order to remain on course. Changing lanes is actually a rather simple task. What can be difficult is to actually make a decision quickly, or at least the correct one and to ensure it is done safely. This tutorial explain the correct technique for changing lanes and if it is actually necessary. Overtaking. In a driving test, this will be done on a dual carriageway and not a single carriageway road. Approaching junctions. This can include roundabouts, T-junctions or crossroads. Dual carriageways and A roads. 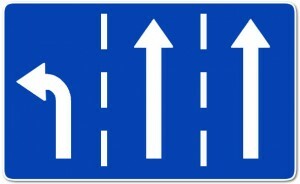 A dual carriageway or ‘A’ roads may require a lane change in order to follow a particular route. Changing lanes whether to the left or right should be done using the Mirror Signal Manoeuvre procedure (MSM). The appropriate blind spot check must also be made before a signal is applied. For multi-lane roundabouts with multiple exits, generally for exits up to 180 degrees from your entry point, keep to either the left or centre lane if going straight ahead. For exits over 180 degrees, use the right hand lane. This is also dependent on road marking or road signs if applicable. If you do need to change lanes on a roundabout, you must first check you mirrors and the applicable blind spot followed by a signal. If there is a vehicle to your side in the lane that you wish to move into, or you are simply uncertain that it is safe to move, remain in your current lane. You can then either continue round the roundabout to the exit again or take an alternative exit. You will not fail a driving test for doing this, but will fail for changing lanes dangerously. Read the full roundabouts tutorial for further information. It’s quite common for learner drivers to find themselves in the incorrect lane during a driving test. This could be one-way-systems, approaching roundabouts or junctions etc. The last thing you want to do is to panic and abruptly get into the lane you’re supposed to be in. Use the correct MSM routine and the blind spot and if it is safe for you to change lanes, do so, if not, cancel any signals and remain in your current lane. Don’t slow down to let a car pass that is in the lane you wish to take as this can be dangerous for vehicles behind. The examiner will take you on an alternative route. We all make mistakes whilst driving, the difference is whether it’s a safe or dangerous mistake. If you are taking a driving test where a dual carriageway is close to the test centre, the likelihood is you will be driving on it. You are not likely to spend too much time on a dual carriageway so whether you need to overtake depends on the traffic and its speed at that time. When you have joined the dual carriageway and approach a slow moving vehicle, you will be expected to make progress and overtake. The examiner will however inform you of which exit you will be taking, so only overtake if you have plenty of time to do so. The MSPSL driving routine should be implemented for overtaking and also the blind spot must be checked before signalling. Upon checking the mirrors and the blind spot, ensure there is plenty of distance from yourself and any vehicles in the fast lane before changing lanes. Also beware of vehicles that may be approaching from behind at speed as forcing another vehicle to slow down, even if they’re driving well over the speed limit is dangerous and will fail a driving test. If in the slightest doubt that it is safe to change lanes, remain in the slow lane until you are confident it is safe or you reach your exit. Always use the Mirror Signal Manoeuvre routine, or one of the alternatives. Further information about these can be found in the driving routine section. Always check the blind spot of the direction you are changing lanes into before signalling and moving the car. Whatever the situation and where ever you are, if you are not completely confident it is safe to change lanes, cancel and signals if applied and remain in your current lane, even if it takes you in the wrong direction. Hi, I’m taking my test on Friday in the morning rush hour and will more than likely go on a dual carriagway with multiple multilane roundabouts. I was wondering about changing lanes when I need to turn right on a roundabout during such a busy time. My instructor says I need to be ‘more selfish’ and has made me cut in front of cars to get in the right hand lane but I find the whole process extremely nerve racking and I just can’t seem to understand the contradictions. I know I shouldn’t make other cars slow down or break. I’m confused? Whilst in the ‘real world’ you do on occasions need to be a little pushy, during your driving test you need to be careful as causing another driver change speed or direction will likely result in a test failure. I would be more inclined to assess the specific roads that you’re driving on during the morning of your test. If they are very busy, then change lanes a little earlier than you would do normally. The most important thing to remember though, is that if you do need to change lanes, say change into the right lane on a dual carriageway for example and if it doesn’t look safe enough to do so, then don’t do it. Talk to the examiner, tell them that you’re getting into lane earlier than normal because it’s busy, or if you can’t do it, tell them that you’ll be taking an alternative exit because it’s not safe to change lanes. They will then know the reasons why you’re doing what you’re doing.